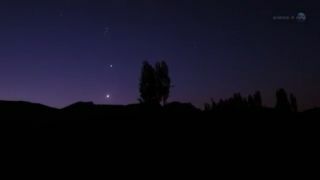 This still from a NASA video shows how planets Venus and Jupiter will appear in the pre-dawn sky of July in 2012. On July 4, the Venus passes through the star cluster Hyades. The two brightest planets in the night sky will kick off a July sky show early Wednesday (July 4) in a sort of celestial show-opener for the Fourth of July holiday in the U.S. Mars, Saturn and a nearly full moon will end the show at night. The planets Venus and Jupiter will kick off their month-long sky show before sunrise on the Fourth of July, when the two planets will shine bright in the eastern sky, weather permitting, according to a NASA alert. "Look out any east-facing window to see Venus and Jupiter, shining side-by-side, so close together you can hide them behind your outstretched palm," astronomer Tony Phillips explained in the NASA planet-gazing advisory. "It's a great way to start the day." On the evening of July 4, the planets Mars and Saturn are visible in the western night sky, weather permitting. Saturn will shine above and to the right of the bright star Spica, with reddish-orange Mars appearing to the lower right of Saturn, near the constellation Leo, the Lion. Meanwhile, the moon will also appear bright all evening, just one day after reaching its full moon phase for the month. This sky map still by NASA's Jet Propulsion Laboratory shows the location of Mars, Saturn and the bright star Spica in the western night sky July 4, 2012. By Saturday (July 7), the planetary arrangement will have changed. Venus and Jupiter will align with the bright star Aldebaran, which serves as the unblinking red eye in the constellation Taurus, the Bull. "Together with Venus and Jupiter, it forms an almost perfect vertical line in the brightening dawn sky," Phillips said. On July 9, Venus and Aldebaran will appear so close they should form a spectacular pair, with Jupiter above them. The crescent moon will join the sky show on July 14, when it will be a slender arc that forms one point of a cosmic triangle with Jupiter and Venus, Phillips explained. This isn't the first time this year that Venus and Jupiter have teamed up to offer a dazzling celestial display. For several months at the beginning of 2012, Venus and Jupiter sparkled together in the evening sky as bright planetary pinpoints. Since then, the two planets have shifted into the morning sky.